Presenting a “security first” proposal to the United Nations (UN), Hungary has announced it is “ready to fight” the globalist body over plans to promote mass migration. Hungary’s leader Viktor Orban has also stood against George Soros, calling for a European “patriotic alliance” to fight Soros and save Europe from Islamization. 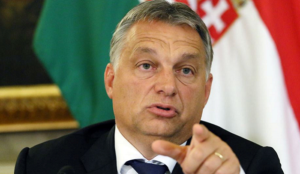 Years ago, Orban rightly stated that Europe was in a “grip of madness” and warned that its “Christian identity” was threatened. Orban has not budged in his stand against mass Muslim migration. Now he is standing against the UN’s “no borders plan,” which is sure to be a tough fight, given the UN’s alliance with the Organization of Islamic Cooperation — which aims to Islamize the globe. The country’s conservative government submitted the 12-point proposal in response to the “dangerous” so-called Global Compact for Migration, which was described by President Donald J. Trump as a “no borders plan” when he withdrew the U.S. from talks in December. Announcing the proposal in Budapest, Foreign Secretary Peter Szijjártó warned: “If these 12 points, in which the Government summarises its position, are not included in the package, Hungary will not be in a position to support the adoption of the Compact. “The goal of the proposal is to ensure that the security of the Hungarian people can continue to be guaranteed in future,” he said, declaring that “the Government and the governing parties are ready to fight this battle”. Entitled “Security First”, Hungary’s document begins by challenging the key claim on which the UN package was built — that mass migration is both beneficial and unstoppable — noting events in recent years have shown the process has “caused serious security challenges in many regions of the world”….. Yesterday, all our troubles seemed so far away. Now it looks like hyper third world immigration is here to stay. Suddenly, this is not half the Canada it used to be. There’s a shadow of thought control hanging over me. Why Anglo-Celtic Canada had to go away, I don’t know—-politicians wouldn’t say. I said something politically incorrect so I long for yesterday. Yesterday, freedom of speech was such an easy game to play. Now I need a place to hide away, is there a Euro-Canadian ethno-state where I can stay? Why free speech had to go, I don’t know—–the Thought Police wouldn’t say. I said something Islamophobic, now I long for yesterday, day, yeh yeh. Yesterday, Euro-Canadian pride and patriotism was such an easy game to play. Now I need a place to hide away, is your bunker A-OK? Eh? Oh I believe that European Canada will once again have its day……mmmmmm…..